One sure sign of spring is the appearance of Western Skunk Cabbage, also known as simply Skunk Cabbage or Swamp Lantern (Lysichiton americanus in the west and Symplocarpus foetidus in the east), pushing its way up through the snow to claim the title of the earliest sentinel of spring. 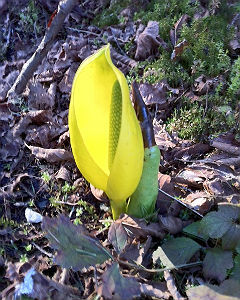 Skunk Cabbage, in addition to its beautiful bright yellow hood, or spathe, and large green leaves is fascinating because of its ability to melt the snow in order to make its way to the sun. For about 12-14 days in late winter it consumes oxygen as it breaks down starch stored in its roots. This process generates enough heat for the plant to maintain a temperature of 36 degrees as it melts its way through the snow. Hummingbirds also signal the arrival of spring when they return from their winter homes in Panama and southern Mexico and fly around in search of hummingbird feeders and colorful hanging fuchsia baskets that keep them nourished until the wildflowers burst with blossoms. Arctic terns also have returned, flying in from Southern South America and Antarctica, making the longest migration of any bird or animal, traveling over 12,000 miles to nesting sites in Alaska. In Juneau, about 80 terns gather near Mendenhall Lake and will stay in the area until they fly south again in mid-August. They can be seen through binoculars from the shore and through spotting scopes from the Tongass National Forest Mendenhall Glacier Visitor Center. 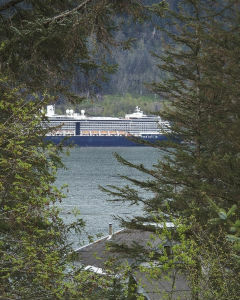 Looking through spotting scopes from the visitor center or from locations on Douglas Island or downtown Juneau we also watch bears that have come out of hibernation and mountain goats and their kids making their way into the lower elevations in search of tender spring vegetation. 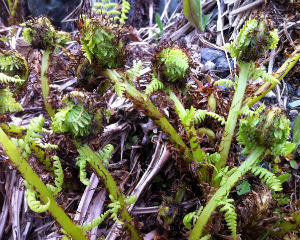 Local human residents also venture out in search of spring greens, especially the tender, succulent curled heads of the fiddlehead ferns that are so yummy sautéed in butter or added to a salad. We also see the lowest tides of the year, providing an opportunity to explore what the winter storms have deposited on local beaches and tide flats. Spring, with summer hot on its heels, has arrived. The Carnival Spirit, the first cruise ship of the year, with many more to follow in its wake, arrived on Friday May 6 bringing 2,000 visitors into our community. Close to a million visitors will arrive by ship over the next four months. The 2011 cruise season will end when the Century, the final ship of the year, sets sail at 8:30 PM on September 24. Between now and then visitors rule downtown Juneau and frequent many of our trails and favorite places we go to enjoy good weather. On clear days they seem to own the skies as well, with helicopters and float planes a constant presence overhead. The helicopters flying visitors up and around the Juneau Icefield are known around town as the “mosquito fleet” for the buzzing sound they make overhead, often five or six in a row, as they fly from their pad near the airport up and over the Mendenhall Glacier. Three ships arrived on Wednesday May 11 and they made their presence known long before they docked. You didn’t have to see them to know they were arriving and you didn’t have to open your eyes and look out the window to know the fog was thick. In fact, when I did look out I couldn’t see the ships through the fog, and they couldn’t see each other. As a result, starting at the tender hour of 4:00 A.M. , they began sounding their fog horns every five minutes, blanketing the town with a loud noise that reverberated from the mountains behind the city across to the mountains on Douglas Island where I live and back again. It was like having an obnoxious alarm clock that went off every five minutes and no way to turn it off! Finally the ships docked safely, their horns silenced and the fog lifted to disclose a beautiful sunny day to be enjoyed by residents and visitors alike. Spring events trip over each other as we transition from winter to summer. There is the Juneau Audubon Society bird watching cruise to Berners Bay, just north of Juneau, in April. We barely have time to catch our breath after the week-long Alaska Folk Festival in Juneau, also in April, when Juneau Jazz and Classics begins its three week run of jazz, blues, and classical music concerts. There are free concerts at lunch time in the State Office Building and free and reasonably priced evening concerts at a variety of venues around town, including local churches, the Juneau Arts and Culture Center and the Centennial Hall convention center. Guest artists (always an amazing line-up) also perform for students in area schools and teach workshops while they are in town. Juneau Jazz and Classics also sponsors a free Saturday of fun and music at the University of Alaska’s Auke Lake Campus. This year the event was on May 14, 2011. The Second Annual Maritime Festival was happening in downtown Juneau on the same day. (It was an amazingly beautiful day!) The Southeast Master Gardeners Association held their Annual Plant Sale May 7, the same morning that brave runners dashed across the mudflats between Douglas Island and the Juneau airport in the Spring Tide Scramble, sponsored by Southeast Road Runners. Farther north the Nenana Ice Classic has come to an end for another year with the ice going out on the Tanana River on May 4, 2011 at 4:24 PM. As their reward for guessing the date and time of the breakup 22 winners will split the $338,062 purse and enjoy the celebrity of being this year’s winners. Looking into the future, Saturday June 4 is National Trails Day. This day celebrates America’s 200,000 miles of trails, and the boundless energy of trail supporters and volunteers. The American Hiking Society and sponsors Backpacker Magazine, Columbia, Eastern Mountain Sports, Fetzer, Merrell, The North Face and partners REI and American Park Network are hosting over two thousand events around the country. The 2011 theme is Made With All Natural Ingredients. The American Hiking Society encourages everyone to get outdoors and to invite someone new to the outdoors to come along. For more information or to find an event near you go to www.AmericanHiking.org. June 11 is National Get Outdoors (GO) Day celebrating America’s Great Outdoors and encouraging kids and their families to explore the outdoors together. Lead by the USDA Forest Service and the American Recreation Coalition this effort builds partnerships between public and private sector interests. The focus of GO day is to influence Americans, especially youth, to participate in outdoor activities and to make outdoor recreation a part of healthy lifestyles. For more information about GO Day events go to www.nationalgetoutdoorsday.org. How will YOU celebrate National Trails Day and National Get Outdoors Day? Heath and wellness has been a common thread throughout my blogs and I am continuing to stitch with that thread again this month. So many things could distract me – the earthquake, tsunami and nuclear power plant melt downs in Japan followed by yet additional earthquakes occurring again this week. Add to that the near melt down of our government operations as negotiations continued right up to the last minute to determine whether there would be a government-wide shut down reminiscent of the shut downs in 1995-96. So far it appears that government offices will be open for business at least for now although debates on the budget will continue. Even with all that excitement I’ll return to my health and wellness theme. My focus this month is on the growing number of retirees and other members of the baby boomer generation who were born between 1946 and 1964. Baby boomers started turning 65 this year and their growing ranks are causing concern partly because of the impact they will have on Medicare. This is the fastest growing age group made up of around 39 million Americans, a number that will increase to 71 million by 2030. According to the American Hospital Association 60 percent of these folks will experience more than 1 chronic condition by 2030. These conditions include diabetes, arthritis, congestive heart failure and dementia. Chronic conditions are also the leading cause of death for older adults. Last fall I went to a meeting of our local AARP Chapter. The Alaska State Director and the AARP National President were speakers. They each addressed health care and the need to get run away health care costs under control. As they fielded questions from a very interested audience I pondered why no one was talking about the things each one of us can do to improve our own health and the preventative steps we can take to avoid being part of that 60 percent. It was puzzling to me because there is so much each of us can do to improve and insure (to a certain degree) our own health and wellbeing with many ideas showing up in the AARP magazine. AARP The Magazine arrives in my post office box every other month with an extensive health section that incorporates suggestions for maintaining and improving mental and physical health. Examples from September/October 2010 include articles on “green exercise”, fitness, maintaining healthy cholesterol levels and immune system health. I’m a regular reader and always save – and share – these articles even after the rest of the magazine has gone to the recycle bin. I didn’t speak up but shortly after the meeting I contacted Juneau Chapter President to volunteer to present a session at AARP Day, which will take place at the end of April. There will be sessions on financial planning, tax law changes, estate planning, and Medicare, as well as cooking, stress reduction, and computer basics, and I’ll be there to talk about how being active outdoors can contribute to health and well-being. I plan to highlight research from a study at the University of Essex in England that found that just five minutes a day of “green exercise” could boost your mood and self-esteem and reduce odds of depression and other psychological conditions. Green exercise can include gardening, fishing, walking, cycling – basically being active outdoors in a natural setting. In addition to the benefits of vitamin D from the sun (if you live where you have sun) other benefits include enhanced cognitive functioning and increased compassion, and positive effects on blood pressure, cholesterol, and stress. Some studies have also documented links between spending time in nature and longevity and decreased risk of mental illness. Other research has found that walking can reduce diabetes incidence and lower mortality for those who have diabetes. One death per year may be preventable for every 61 people who walk at least 2 hours a week. While preventing one death per year may not seem like much I’m sure most of us know people with diabetes and it would make me happy if the diabetics that I know could avoid being a casualty of the disease…. and 2 hours a week is less than twenty minutes a day. Diabetes often leads to the need for dialysis treatments that are not only inconvenient for the patient but also very expensive for society. In June 2006, the National Institutes of Health (NIH) and Centers for Disease Control and Prevention (CDC) reported that nearly 22% of people 65 or older had diabetes with cases expected to increase 336 % over the next 50 years. If current trends continue one in three Americans born in 2000 will develop diabetes and this is not just a problem in the United States. The World Health Organization predicts that diabetes will rise 50 percent in the next decade with diabetes deaths doubling in the next ten years. It is frustrating that effective preventive measures are available through lifestyle changes but not everyone takes advantage of them. In addition to being a preventative for diabetes, green exercise, specifically walking in forests and other natural settings has been shown to reduce stress, improve moods, reduce anger and aggressiveness and increase overall happiness (see Rural Connections – Healthy Communities Issue, Volume 5, Issue 1 – 2.3MB PDF). Walking is an especially good activity because, in addition to having less impact on your joints than running, if you swing your arms as most of us do, walking is a bilateral activity—meaning it allows us to access the whole brain. This makes it a very grounding activity that can result in increased creativity and healthy processing of emotions. As I mentioned in my article in Rural Connections (linked above) studies of “forest bathing” in Japan – short leisurely visits to a forest – increased vigor, decreased anxiety, depression, anger, may decrease psychosocial stress related diseases, and increased levels of a cell that releases anticancer proteins in the blood that work to prevent cancer generation and development. So, you’ve been treated to a preview of my session at AARP Day in Juneau. In addition to sharing research findings I’ll be asking participants what kinds of outdoor activities they enjoy, what experiences they can share about the benefits they observe, and what we can do locally to encourage more people to engage in outdoor activities. What do people find as barriers or impediments to getting outdoors for a walk? I know for me it is mostly making time to head outdoors. In fact, I think it is time for me to head out right now! Linda Kruger is a social scientist with the U.S. Forest Service, Pacific Northwest Research Station in Juneau, Alaska. Rural Jobs Accelerator Grant – Apply today! Accepting abstracts on local food hubs! Enter your email address to follow the Western Rural Development Center blog and receive notifications of new posts by email.